Israeli soldiers abducted, on Thursday at dawn, a wounded Palestinian teen from his home in Deheishe refugee camp, south of Bethlehem, and injured several other Palestinians. 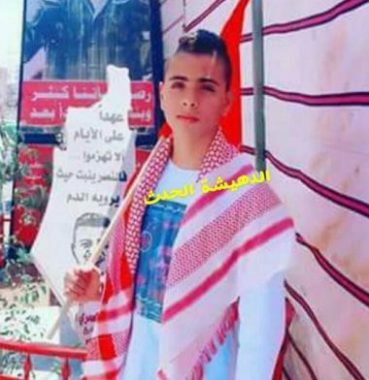 Media sources in Bethlehem said the soldiers invaded the family home of Hussein Eyad Shahin, 17, and searched the property before abducting him. Several youngsters hurled stones at the invading army jeeps, while the soldiers fired live rounds, rubber-coated steel bullets and gas bombs. It is worth mentioning that, in December of last year, the soldiers shot Shahin with three live rounds in his leg during an invasion into the refugee camp.